The Mexican cowboys see antler width as the primary criterion for a muy grande. 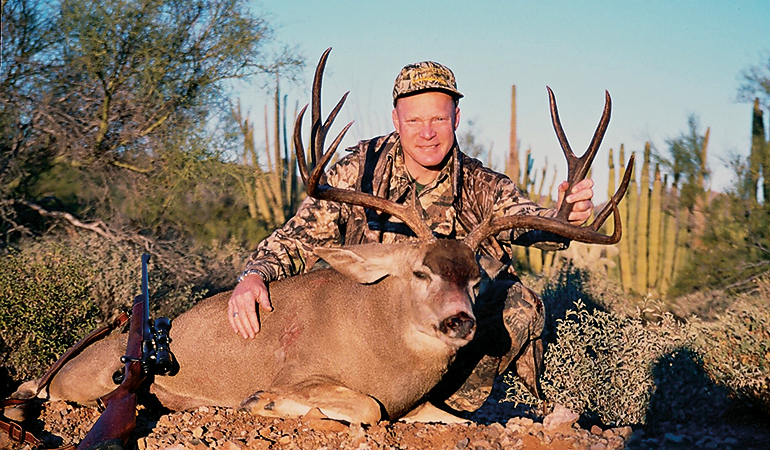 This is a good Sonoran buck with a 32-inch spread, but I wish he was a bit heavier. I should have looked a few seconds longer. Head for warmer temperatures to get a shot at the Rocky Mountain mule deer's distant cousin: the desert mule deer. The shorthair went on point in thorny brush above a little dirt stock tank, a perfect place for Gambel’s quail. Everyone set, somebody stepped forward and kicked a dry cactus. The brush exploded, but not with whirring wings. A gorgeous 4x4 mule deer buck burst out and vanished into the desert horizon. I reckon that was 25 years ago, hunting quail not far from Tucson with the late Gary Sitton, a former editor of this magazine. The buck was a desert mule deer. Slightly smaller than his Rocky Mountain cousin, the desert mule deer tends to be paler in body color with a lighter forehead cap. Together with the desert bighorn and Coues whitetail, the desert mule deer is part and parcel to the arid Southwest, occupying a huge range from West Texas across southern Arizona and New Mexico and northwestern Mexico. A mature desert mule deer buck tries to hide in an ocotillo forest in the Davis Mountains of Far West Texas. At this writing science doesn’t support this, but if you want a big desert mule deer—or just a big mule deer—then the Sonoran Desert is one of the great places. It is certainly not the only place. 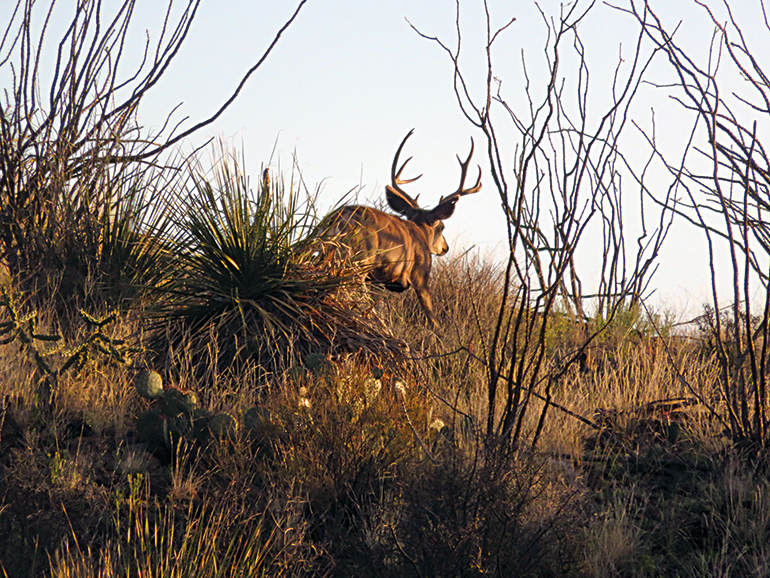 Texas is a whitetail state, but the deserts and mountains of Far West Texas are mule deer habitat. Conditions are harsh and the population fluctuates widely depending on rainfall. Even so, in bad times Texas is home to 100,000 desert mule deer. After a few good years, the population has swollen to more than 200,000. Texas is not known for producing really big mule deer, but it is primarily a private land state and Texans know how to manage deer. For many years, Texas mule deer were more or less left to Mother Nature, but today a lot of ranchers and outfitters are focusing on mule deer, limiting harvests and improving water and habitat. Mule deer respond surprisingly well to a bit of nurturing; the average Texas mule deer buck today is bigger than you might expect, and monsters are turning up every year. The same can be said of desert mule deer on managed lands in Coahuila and Chihuahua. Considering the great difficulty in finding a “really good” muley in the Rocky Mountain West today, the desert mule deer should not be overlooked. Blistering hot in the long summer, desert mule deer country is mild and pleasant in late fall and winter. The country is spectacular, encompassing rocky buttes and ridges, ocotillo forests, and plenty of cactus. For me, the most common hunting methodology is perfect: glassing and stalking. There are usually ranch roads to glass from, so the hunting is as physical as you want to make it. I like hiking and climbing from one vantage point to another. Desert mule deer are thin on the ground, so don’t expect to see big numbers. However, put in the time and you’ll see more deer than you expect. There are two additional hunting techniques. I like one of them; the other I don’t. Both are mostly peculiar to the Sonoran Desert. Here, perhaps because there’s more browse in the valleys than up in the rocks, deer are far more likely to be seen on the desert floor than up in the hills. This is problematic because although dry it’s very much a living desert, blanketed by brush too tall for effective glassing. So one technique employed a lot in Sonora, unfortunately, is “high-racking,” cruising ranch roads in a vehicle with an elevated platform. This allows you to see over the brush, at least for a few hundred yards. It works, but it’s not my thing. The other Sonoran technique is tracking. It’s famous and should be. African trackers are legendary, but the Mexican cowboys who track mule deer (and not all can) are the best trackers I’ve ever seen. You won’t find a good track every day, but when you do, these guys can tell if it’s a buck or a doe—and if it’s a buck, whether it’s worth following. This says nothing about antlers, but if they want to follow a track, it’s worth a look. If the wind holds, they can follow a track to the end of the earth. Sonoran mule deer hunts have gotten kind of pricey, but if you seek (and insist on) a tracking hunt, it’s worth the money just to see a great tracker at work. Success is not guaranteed. The big ones—muy grande—are not plentiful. I figure the odds are much the same as, say, a hunt for a big northern whitetail in Alberta or Saskatchewan. It depends on the year and you must do your homework carefully. but when it happens, what an amazing experience. Two of the desert mule deer I took down there were shot in their beds, both after several hours of tracking. You think it’s a put-on as they follow faint marks you can’t see. In soft sand it’s easy, but these guys follow across gravel tailings and hard-baked ground. Trust me, they will see the buck long before you do.